Positive Motion Physiotherapy remains the only physiotherapy practice in Canberra that specialises in oncology and lymphoedema management. Our longer consultations allow us to tailor treatment plans to the individual. We are able to provide a comprehensive range of services to manage a range of conditions associated with oedema and lymphoedema. We have recently added a LymphaTouch device to our repertoire of treatment options. For more information, ask your therapist! Post-operative management is designed to support the healing process of clients who are recently post-surgery or undergoing treatments. Our therapists can assist you with maintaining healthy tissue function and facilitating healing whether it be post-operative scar tissue or oedema-related skin changes. For those clients who are in the next phase of their recovery may benefit from a program or class that focuses on strengthening and stretching for the upper body, lower body, abdominal strength and stability. For those who require oedema management that may be due to other primary or secondary conditions, our therapists will tailor a management program to suit your needs. A growing body of evidence-based literature supports the use of low level laser therapy for wound healing, pain relief, improving tissue health and stimulating circulation. Bioimpedence﻿ spectroscopy assists in the early detection of lymphoedema. It can also be used as a tool to collect pre-operative baseline measurements prior to surgery involving lymph nodes. For those clients who may need more intensive management of their lymphoedema (or associated oedema), we are able to provide Complex Physical Therapy (CPT). PhysioTouch® is a device that is designed to support lymphatic drainage. The negative pressure generated by the device helps improve lymphatic circulation in the treated area. In addition to negative pressure, it has a mechanical high-frequency vibration feature. Self-management is an important part of managing chronic oedema/lymphoedema. We can provide you with advice and products to assist in optimal self-management. 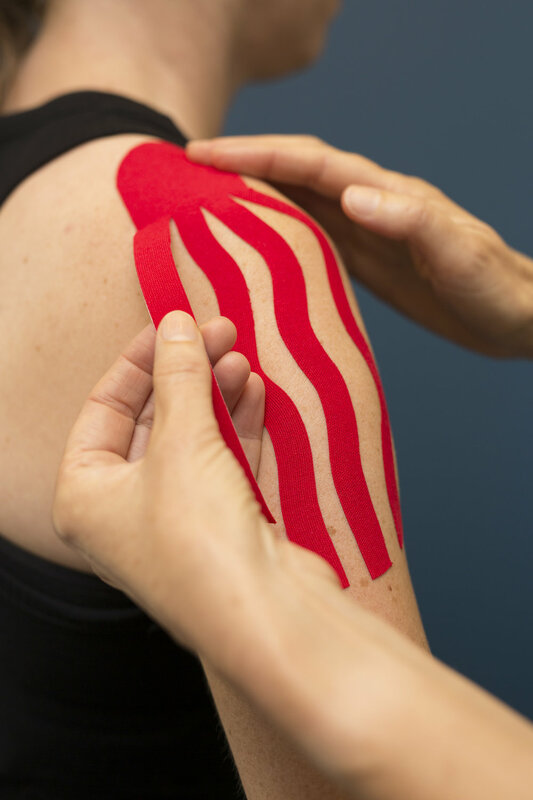 Kinesiotaping or lymphatic taping can be used to assist with lymphatic drainage at the surface layers of the skin.